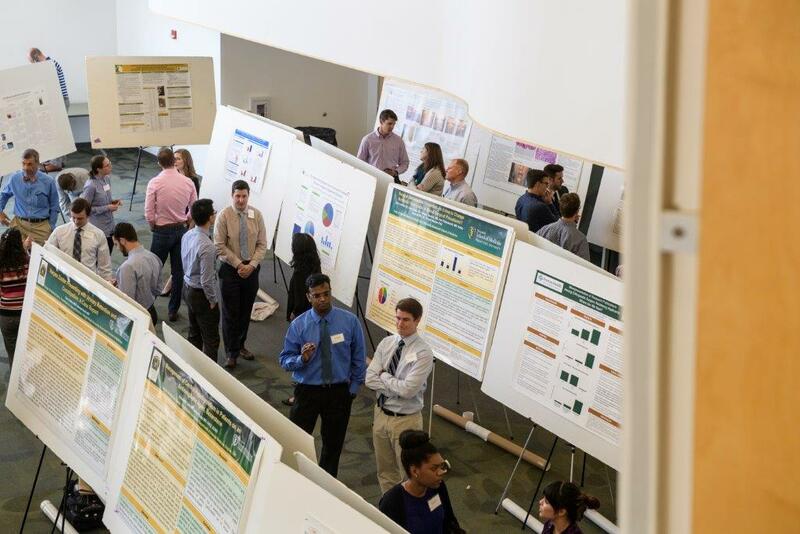 Students in the Research Learning Community at the Wright State University Boonshoft School of Medicine have sponsored and organized the annual Medical Student Research Symposium since 2009. 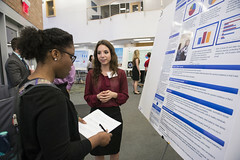 Medical students present posters that describe their research, and compete for cash prizes. Scholar Awards are also presented to graduating medical students who have demonstrated a continued commitment to medical scholarship. The Research Learning Community was developed by the Medical Student Research Club and the Office of Research Affairs to promote research-related educational opportunities for WSU medical students. For more information, contact Priya Small, Research Coordinator, at priya.small@wright.edu. When: Monday, April 1, 2019, 5:30-8 p.m.
Who: All students and faculty are invited to attend. This event highlights the extraordinary research endeavors undertaken by students at the Boonshoft School of Medicine. If you have participated in any research while affiliated with Wright State, this is a great opportunity to display your hard work in either a poster or oral presentation format. This year, digital posters will not be available but students can do a 5-minute oral presentation if they prefer that option or are unable to do a printed poster presentation. Abstracts may be submitted here. Questions should be directed to: Olivia Grondalski or Phillip Walker, 2019 Symposium Directors, or Priya Small, Research Coordinator, Office of Medical Education. When: Wednesday, April 11, 2018, 5-7 p.m. This event highlights the extraordinary research endeavors undertaken by students at the Boonshoft School of Medicine. If you have participated in any research while affiliated with Wright State, this is a great opportunity to display your hard work in either a poster or oral presentation format. This year, digital posters will not be available but students can do a 5-minute oral presentation if they prefer that option or are unable to do a printed poster presentation. Abstract submissions are now closed. Questions should be directed to: Lucas Harrison, Zachary Sirois or Phillip Walker, 2018 Symposium Directors. 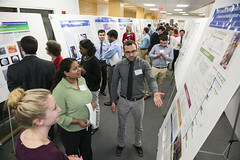 The Medical Student Research Symposium is organized by the Research Learning Community (RLC) and provides an excellent forum for medical students to present their research to faculty and colleagues. If you have done any research while affiliated with Wright State, this is a great opportunity to display your hard work. 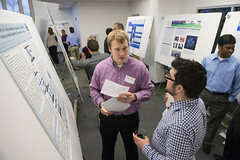 To enter the poster competition and compete for cash prizes, please submit all abstracts by Friday, March 24, at 5 p.m. Abstracts will be published and stored in the library core repository. 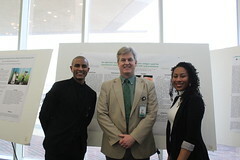 Wright State University medical students presented 62 scientific posters on their research at the 8th Annual Medical Student Research Symposium on April 13, 2016. 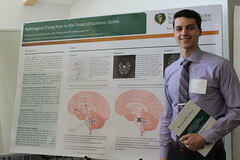 The symposium provides a forum for medical students to present their research to their fellow students, medical school faculty and the greater community. The event is sponsored by the Medical Student Research Club and the Boonshoft School of Medicine Office of Research Affairs. 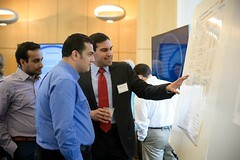 The Seventh Annual Medical Student Research Symposium took place on April 8, 2015, in the Ramesh K. Gandhi Medical Education Center. 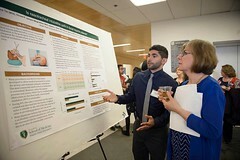 Medical students presented posters describing their research and the following graduating students who have demonstrated a continued commitment to medical scholarship received Distinguished Scholar Awards: Amanda Freeman, M.D./Ph.D. ; Christopher Heid, M.D. ; Kara Joseph, M.D. ; and Ryan Schwieterman, M.D. Symposium directors were Adam Deardorff, Ahmed Hawash and Jacob Vincent. 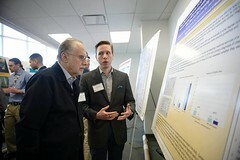 Many thanks go to the poster judges: F. Javier Alvarez-Leefmans, M.D., Ph.D.; Thomas L. Brown, Ph.D.; David Cool, Ph.D.; Timothy C. Cope, Ph.D.; John F. Donnelly, M.D. ; Andrew W. Froehle, Ph.D.; Nadja Grobe, Ph.D.; Thomas E. Herchline, M.D. ; Timothy G. Janz, M.D. ; Karen E. Kirkham, M.D. ; Paul G. Koles, M.D. ; Barbara Kraszpulska, Ph.D.; Smita Krishnamurthy, M.D. ; David R. Ladle, Ph.D.; Ronald J. Markert, Ph.D.; Ramzi W. Nahhas, Ph.D.; Gary L. Nieder, Ph.D.; James E. Olson, Ph.D.; Lawrence J. Prochaska, Ph.D.; Larry J. Ream, Ph.D.; Mark M. Rich, M.D., Ph.D.; Nick A. Ritucci, Ph.D.; Patrick M. Sonner, Ph.D.; Raymond P. Ten Eyck, M.D. ; and Christopher N. Wyatt, Ph.D. 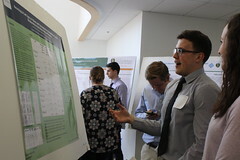 The 6th Annual Medical Student Research Symposium at Wright State University Boonshoft School of Medicine was held April 10, 2014, in White Hall on the WSU main campus. The symposium began with welcoming remarks and presentation of the 2014 Distinguished Scholar Awards. 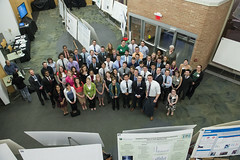 A poster reception with 40 student research posters followed in the White Hall Atrium. 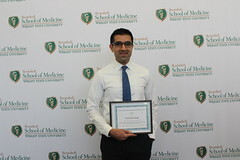 The annual Distinguished Scholar Awards are presented to graduating medical students who have demonstrated a continued commitment to medical scholarship. Distinguished Scholars are recognized for generating a significant body of scholarly work, for working collaboratively with students and faculty, for demonstrating leadership in the Research Learning Community, and for advancing student research at the Boonshoft School of Medicine. The 2014 Distinguished Scholars were Robert Beaulieu; Gabrielle Horstman, Ph.D.; Ann Imber, Ph.D.; and Catherine Ulman. 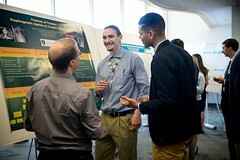 The symposium was organized by the Wright State Medical Student Research Club with support from the BSOM Office of Research Affairs. Robert A. Beaulieu is an M.D. candidate at the Wright State University Boonshoft School of Medicine. He has produced a large body of research over a wide variety of topics. He has studied predictive factors and models that can be used in assessing trauma patients, with an emphasis on discharge disposition. He has studied quality improvement in ophthalmologic care, notably investigating intraocular pressure spikes following selective laser trabeculoplasty, and he has been an active medical education researcher, surveying medical school graduates and residency program directors to assess preparation for internship. He has several publications in peer reviewed journals and has presented his work at numerous regional and national conferences, most recently a podium presentation at the Academic Surgical Congress Annual Meeting. Mr. Beaulieu has been actively involved in the Research Learning Community, where he co-chaired the medical school Journal Club and has presented his work at several Medical Student Research Symposia as well as our Translational Research Lecture Series. He is a member of the Alpha Omega Alpha honor society and the medical school Ophthalmology Interest Group. In addition to his scientific work, Mr. Beaulieu co-founded the medical school Nutrition and Health club, developed the Nutrition in Medicine online elective, serves on the Medical School Student Council, and is Vice President of the fourth year class. He has also participated in several community outreach and volunteer programs, including providing patient care at both Reach Out Montgomery County as well as the Winslow Indian Health Care Center (Winslow, AZ), performing preschool vision screens with the Ohio Optometric Association, organizing an eyeglass collection drive, performing community glaucoma screens, and mentoring local low-income high school students in nutrition, gardening, agriculture, and food production. Mr. Beaulieu will soon begin his residency training in Ophthalmology at University of Texas Southwestern Medical Center in Dallas, Texas after completing a transitional year at the Mount Carmel Heath System in Columbus, Ohio. Gabrielle M. Horstman is an M.D./Ph.D. candidate at the Wright State University Boonshoft School of Medicine. In 2012, she completed her Ph.D. studies in Biomedical Sciences with a concentration in Neuroscience and Physiology in the laboratory of Dr. Timothy Cope. She has produced an extensive body of research on the neural control of movement and the reorganization of spinal circuits following traumatic nerve injury using in vivo physiology and muscle force recordings. Her dissertation, Limitations Of Functional Recovery Of Stretch Reflex Circuitry After Peripheral Nerve Regeneration, provides new insight into the profound discoordination of spinal reflexes that occurs following successful peripheral nerve regeneration. Dr. Horstman has presented her work at regional and international conferences and has several manuscripts in preparation. She is a member of the American Academy of Neurology, the Society for Neuroscience, and the American Physician Scientists Association where she served on the Annual Meeting Planning Committee. In addition to her scientific work, Dr. Horstman has participated in several community outreach and volunteer programs, including teaching neuroscience to middle and high school students in Science Olympiad, serving as organizational director of Student-to-Student, mentoring WSU premedical students, and working with homeless children at the St. Vincent DePaul Apple Street Gateway Shelter. She has been highly involved in the Student Interest Group in Neurology has as well as the Clinical Neuroscience Curriculum Development Committee and the medical school Admissions Committee. She has also served on the Medical School Student Council and is a founding member of the Medical Student Research Club, where her leadership was instrumental to growth of the Medical Student Research Symposium and the Research Learning Community. She is also a classically trained vocalist and a member of a local dance troupe. Dr. Horstman will soon begin her residency training in Neurology at Case Western Reserve University in Cleveland, Ohio. Catherine A. Ulman is an M.D. candidate at the Wright State University Boonshoft School of Medicine. She has generated an extensive body of research in both characterizing various dermatological diseases as well as assessing medical student proficiency in diagnosing and treating these diseases. She is also actively involved in several medical education projects, including studying the effects of medical student personal and academic habits on exam performance and the specific factors that may influence a medical student’s choice of specialty. She has several publications in peer-reviewed journals, co-authored a textbook chapter, and presented at numerous regional and national conferences. In 2013, her poster on Herpes Zoster in a 2 year old vaccinated against varicella won 3rd place at the Ohio Dermatological Society Meeting. She has been actively involved in the Research Learning Community, where she has presented her work at the Translational Research Lecture Series as well as several Annual Research Symposia, winning a best medical education research poster award. In addition to her scientific work, Ms. Ulman is highly involved in the Dermatology Interest Group, is the founder of the Pathology Interest Group, and is a member of the Alpha Omega Alpha honor society. She has also participated in several community outreach and volunteer programs, including providing nutritional education to local charter schools students, mentoring WSU premedical undergraduate students, and providing AIDS education to local grade school students. She has assisted with the AOA canned food drive, the annual WSU community sin cancer screening, Operation Christmas Child, the 5k to cure paralysis, and has spoken on numerous panels for MS1 and MS2 students. Ms. Ulman will soon begin her residency training in Dermatology at the Ohio State University Medicine Center in Columbus, Ohio. Many thanks go to the BSOM faculty who served as poster judges: Thomas L. Brown, Ph.D., David R. Cool, Ph.D., Timothy C. Cope, Ph.D., Adrian Corbett, Ph.D., John F. Donnelly, M.D., B. Laurel Elder, Ph.D., Timothy Janz, M.D., Karen Kirkham, M.D., Paul Koles, M.D., Barbara Kraszpulska, Ph.D., Smita Krishnamurthy, M.D., David R. Ladle, Ph.D., Sabrina M. Neeley, Ph.D., M.P.H., Gary L. Nieder, Ph.D., James E. Olson, Ph.D., Gary Onady, M.D., Ph.D., Lawrence J. Prochaska, Ph.D., Larry J. Ream, Ph.D., Nick A. Ritucci, Ph.D., Mark M. Rich, M.D., Ph.D., Brenda J. B. Roman, M.D., Patrick Sonner, Ph.D., Courtney E. W. Sulentic, Ph.D., Kathryn M. Tchorz, M.D., Raymond P. Ten Eyck, M.D., , M.P.H., Mary Jo Trout, Pharm. D., RPh, Lucile Wrenshall, M.D., Ph.D., Christopher N. Wyatt, Ph.D., Teresa W. Zryd, M.D. Shaina Hecht; Kunal Desai, M.D. ; Hari Polenakovik, M.D. Faculty Mentor: Hari Polenakovik, M.D. Danial Jilani; Ashley K. Fernandes, M.D., Ph.D.; Nicole J. Borges, Ph.D.; Karen Kirkham, M.D. Faculty Mentor: Nicole J. Borges, Ph.D.
Kevin Bree; Jason Hao; Adrienne Stolfie, M.S.P.H;. Ashley K. Fernandes, M.D., Ph.D. Faculty Mentor: Ashley K. Fernandes, M.D., Ph.D.
Udit Singhal; Jinwei Hu; Erica Hlavin Bell, Ph.D.; Arnab Chakravarti, M.D. Faculty Mentor: Arnab Chakravarti, M.D. ; Erica Hlavin Bell, Ph.D.
Jacob Vincent; Paul Nardelli; Krystyna Wieczerak; Mark Rich, M.D., Ph.D.; Timothy C. Cope, Ph.D. Faculty Mentor: Timothy C. Cope, Ph.D. Faculty Mentor: Li Li, M.D., Ph.D.; Cheryl L. Thompson, Ph.D.
H. Tran; H. Phuoc; A.E. Nguyen; A.K. Fernandes, M.D., Ph.D.
Danielle Fleissig; Shalini Forbis, M.D., M.P.H. Faculty Mentor: Shalini Forbis, M.D., M.P.H. Kyle A. Davis; J. Todd Boyd, M.D. Faculty Mentor: J. Todd Boyd, M.D. Adam Altman; Stefanie K. Horne, M.D. Faculty Mentor: Stefanie K. Horne, M.D. Faculty Mentor: Amol Soin, M.D., M.B.A.